I've concentrated here on silk scarves and styles popular in the US and Europe, as I assume that's what most of you will have access to. However, a collection of more 'exotic' scarves - from your travels perhaps, or from stores specializing in imported goods - can be wonderful. For a little inspiration, read this article in which a UK foreign correspondent talks about her collection of scarves. Perhaps autumnal shades, blue tones or even black and white monochrome. This might work well for you if you plan to wear your collection and 'know your colors'! 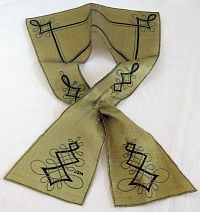 This is probably down to what best suits you and your style, but in addition to the iconic square, choices include long rectangular scarves (with or without pointed 'wing tip' ends), 'infinity' scarves (one long loop of fabric), triangular and collar scarves and even diamond-shaped scarves. A myriad choices include stripes, checks, paisley, batik, tie dye and ikat weave. Silk is the 'classic' scarf fabric of course, but scarves in manmade fabrics have the advantage of being cheaper and are usually easier to care for. Bear in mind that scarves produced during World War II, and for sometime after, are not usually silk, as silk supplies were requisitioned for parachute production. Conversely, Vera got her start in scarves with a quantity of parachute silk that was no longer needed by the military! If silk and manmade equivalents are not your thing, you might prefer to collect cotton (used especially for bandanas), cashmere, or perhaps velvet - a glorious scarf fabric that can be printed, devoré, pleated... or even 'furrowed' (see Scarf Glossary for these and more terms). Those of you who are particularly interested in textiles and fiber arts might enjoy collecting artisan scarves featuring fancy knits, unusual weaves or hand-made lace. Design houses such as Etro, Fortuny and Missoni produce fantastic scarves where the textile art (rather than the print design) often predominates. Craft markets and specialized artisan boutiques are good hunting ground for one-of-a-kind pieces. France and Italy are the 'classic' high quality scarf producing countries. However, Japan has a long history of producing fine printed scarves (including those labeled as 'made in occupied Japan' following WWII), and South Korea and, of course, China are increasingly supplying the world with scarves of all kinds, and at all quality levels. Scarves are still printed in the USA, and on a very small scale in the UK. This is an area rather beyond the scope of this site (although see notes on Scarves and Identity), and certainly beyond my area of expertise! However, there is a thriving collecting scene for soccer/football scarves, particularly in Europe. Many fan clubs have collectors' networks for buying, selling and swapping scarves, and you'll find plenty of fellow enthusiasts on the Internet.